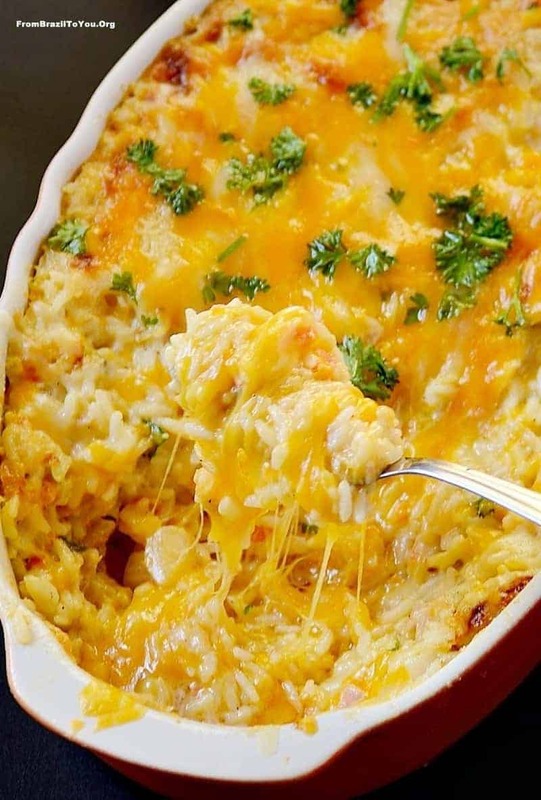 A ham and cheese baked rice casserole to make dinner a delicious yet easy task. Are you a fan of ham and cheese sandwiches? Me too! But what if I told you there is much more that you can do with that combo? Grab a bowl. Mix cooked rice with heavy cream, egg yolks, seasonings, ham, cheese, and a few veggies. Place rice mixture into a baking dish… and bake for about 25-30 minutes. Meanwhile, go to Facebook or read your favorite magazine. Voilá! Dinner will be ready in the blink of an eye. I know… This dish has everything, including the taste of life made easier for busy moms/full-time workers like us. 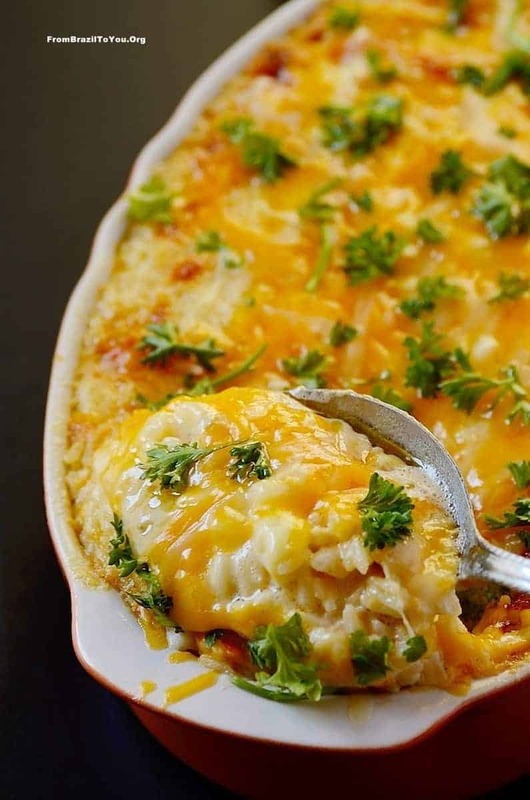 Our ham and cheese baked rice casserole (or arroz de forno misto) and its many variations are popular dishes in Brazil — not only for busy weeknight meals but also for those lazy weekends. First of all, it doesn’t require any special skill from the cook. Second, it is a complete meal all by itself. Third, it is able to take care of those leftovers while transforming them into a delicious meal. It may not have “one-pot” or “one-skillet” in its name, but it is definitely part of that same family. It also makes the list of dishes that are naturally gluten-free. Chicken, bacon, sausage, and shredded jerked beef are just a few of the many variations that Brazilians make use of to transform the basic dish into a new one. In addition, if you choose a different type of rice, such as wild rice, as well as another type of meat, cheese, or vegetable, you can repeat the same recipe yet give it a new name and face. Basically, the only thing you would need to keep constant would be the yolks, heavy cream, salt and pepper. I will leave you now with the formula to one hero of a dish, and to your much-deserved rest. Preheat oven to 350 degrees F. Grease with softened butter and then flour (it can be a gluten-free one) a medium baking dish; set aside. NOTE: If desired, you can place chunks of onion and carrot plus 1 cup of fresh parsley into a food processor and process until obtaining small pieces -- to avoid having to chop them by hand. In a large bowl, whisk the yolks with the heavy cream. Add the onion, carrot, 1 cup of chopped parsley, salt and pepper, mozzarella, ham, and rice. Stir with a wooden spoon until obtaining a homogeneous mixture. Place rice mixture into the greased/floured baking dish. Sprinkle the Parmesan cheese on top evenly. Bake, uncovered, for about 25-30 minutes on the lowest oven rack. Sprinkle 1/4 cup of chopped parsley on top and serve. Enjoy! Leftovers must be covered and refrigerated for up to 2 days. Heat well before eating. What a wonderful dinner recipe! One dish dinners are such time savers. The huge plus this recipe brings is all that scrumptious, creamy sauce. And a great way to use up leftovers! This is a great idea to use leftover rice. This would be perfect for me to take to work for lunch! Now this is really something here… you convinced me girl. I can think of a gazillion of varieties for this amazing dish. 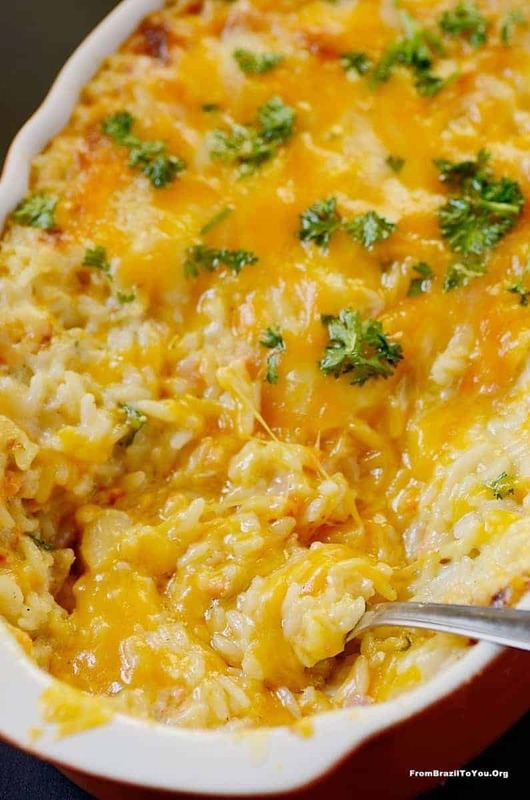 Your arroz de forno looks so delicious. Great looking dish! I love to do gratins like this — so much flavor. And I can never resist a cheesy dish. 🙂 Good stuff — thanks. I was wondering what I should cook for dinner tonight- now I know! Thanks for the idea! Such a decadent looking dish my dear. So comforting. My boys would love to have this. Wow. Just like Ash says, this is a rich, decadent dish, that completely transforms any leftover rice. 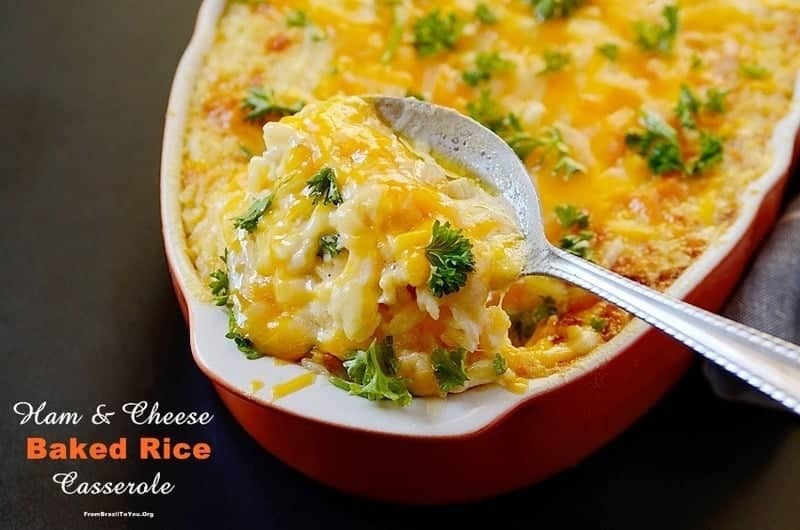 Beautiful rice casserole dear Denise and like you mentioned, the possibilities are endless! We’ll be trying that one with broccoli and other veggies as we’ve cut down (drastically) our bacon and processed meats consumption ourselves. We bet it’ll taste amazing! I won a bunch of crock pots and dishes that I just haven’t known what I will cook in them, that is until now. I freakin LOVE this super simple yet oh so tasty feed, perfect week night feed. Adding to my list. Thanks love. Wow! Thanks a ton, Dom! I am so glad your family enjoyed this dish which is truly a family favorite at my household. This is exactly what I was looking for, thank you so much! Had to laugh out loud over your requeijão comment! We put Catupiry in EVERYTHING! I plan on making this tonight, it is snowing outside and Arroz de Forno is perfect, I will serve it with pão de queijo! Dorace: I am so glad that you found here the recipe that you needed. This is a family fave. Enjoy! Denisse I’m rapidly becomeing your number one fan. Love your pics and recipes! Keep rocking my friend! 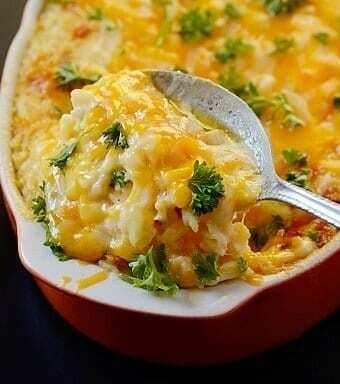 My family and I love this cheesy, delicious casserole! This looks so delicious and easy to make, a winner! I want to try this recipe, but was hoping to avoid cooking the rice ahead of time. Do you have any suggested adaptations for using uncooked rice? I’m wondering how much extra moisture I should put in. Hi, Alyssa! Yes, you can adapt this recipe for sure. 1. In a large baking pan or pyrex, mix 1 cup of (uncooked) parboiled long grain rice with 2 1/4 cups BOILING water and 2 TBSP butter. Bake covered for about 20-25 minutes. 2. Then, uncovered pan and mix the just cooked rice in the oven with all the other ingredients and their amounts stated in the recipe. Bake for the time stated there. NOTE: Make sure any added liquids are at least warm or hot; otherwise cream will curd. I hope this helps. It will take more time to get this recipe ready but that is the best way to adapt this recipe without having to use cooked rice leftovers.